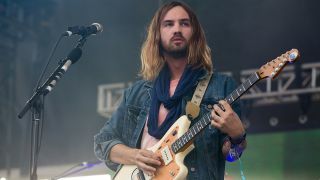 Tame Impala’s Kevin Parker confirms he is currently working on new music. The singer/songwriter is writing new material less than a year after the Australian outfit released their album Currents. Parker tells Australian Associated Press (via Yahoo): “I think after a long tour and after an album, your brain feels like it wants to relax but at the same time making music for me is something that comes kind of naturally. Just like a brain process. But the singer admits he is never sure whether the material he’s written will be for Tame Impala or another artist until it’s done. Tame Impala won Best International group at the 2016 Brit Awards in February. They’ve also scheduled tour dates across Asia, Europe and North America from April until September.